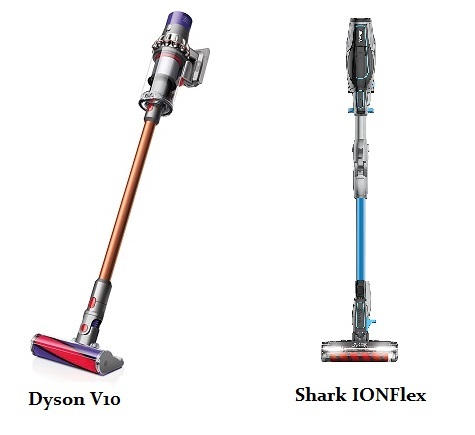 The IONFlex is one of the most versatile vacuums available today which comes as no surprise if you know anything about Shark’s lineup or their story in general. They market it with “Hassle Free Runtime” but what does that mean? It means that you can be charging it while you are vacuuming your home. The 2X in the name means it comes with 2 lithium ion batteries that are REMOVABLE! This is a big advantage over the V10 (more on that later). 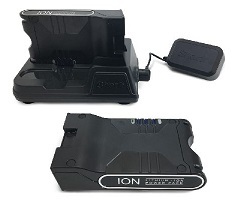 Another really unique feature is related to a different part of its’ name…IONFlex. 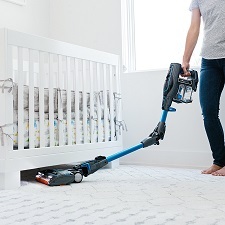 Shark has developed what they call MultiFLEX technology where the body of the vacuum (wand) has a hinge that allows you to move it in various directions or angles. You can still clean at max power but can put the power head under furniture or other items around the house without moving anything out of the way. This modern feature is something that Shark has pioneered and is a huge reason why the IONFlex 2X is one of the best cordless vacuums you will find today. Other features include a handheld mode with attachments, their anti-allergen complete seal to trap dust mites inside, washable filters, and LED headlights. Their DuoClean head has the added benefit of trapping small dirt particles as well as larger debris without missing a beat. There is quite a bit of technology packed into this lightweight frame which makes it a tough opponent for the popular contender from Dyson. When it comes to power there are few brands that can match what Dyson vacuum motors put out and the V10 carries on that tradition. This power along with 3 different suction modes provide a lot of versatility when you are making your way around your home. Suction Modes 1 and 2 are what you will use most of the time depending on if you are on smooth surfaces like tile and laminate or if you are vacuuming carpets. Boost Mode is what you need for a quick burst of intense power for deep cleaning embedded dirt. Keep in mind that this will drain the battery quickly so it is recommended to use wisely! It comes in three different configurations which gives you some choices to suit your household cleaning needs. The Absolute, Animal, and Motorhead models all have the same power but with slight differences. The top of the line choice is the Absolute which comes with both a Torque Drive cleaner head for deep cleaning carpets and a soft roller for hard floors. In addition to that you get a mini motorized tool with spinning brushes to pull hair off all surfaces. The Animal is similar and is designed more for homes with one or more pets. It does not, however, come with the soft roller so it is mainly for homes with a lot of carpeting to clean. The Motorhead is their most basic V10 model that comes with their Direct Drive head and 2 additional tools. Other features of the Dyson V10 include whole machine HEPA filtration that traps 99.97% of the smallest of allergens, a huge dust bin, very high tech batteries, and a variety of helpful attachments. It’s a more expensive cord-free choice than the Shark but is it worth it? Let’s start our side by side comparison in the various categories to find out. Power might not be the most important thing with cordless vacuum cleaners but it’s good to know which models are rated the highest. This is especially important when trying to deep clean your carpet or pull pet hair out of your furniture. The Shark IONFlex has been tested to put out somewhere between 100 and 115 air watts of suction power which is respectable in its’ class. A typical full sized corded upright might be around 200 or more for comparison. The Dyson V10 is the clear winner here as it puts out 130 aw on the standard setting with as much as 150 with the max setting. This is a tremendous amount of power which shows just how far cord-free vacuums have come in such a short time. The V10 has an all new digital motor that has been upgraded from their prior generation of ‘V’ series models, which were the previous kings of the suction wars. While power isn’t always an important factor if you have mostly hard floors it can be the deciding factor when dealing with carpeting. And in this category the Dyson V10 is the winner. The quality of the battery is very important when deciding on which lightweight cordless vacuum to buy. Both of these offerings come with the latest lithium ion batteries which are far superior to prior generations. The biggest advantage to them is they provide fade-free power so you will hardly notice a decrease in performance as you are using it. You will get close to full power output right up until the battery is drained. The Dyson V10 has a single (non-removable) lithium ion battery that comes with 7 cells. All of these cells are needed to turn the powerful motor that sits inside. They claim you will get as long as 60 minutes of run time but that is really on their lowest setting with a non-motorized tool attached. 30 minutes is a more accurate measure, but that is on a standard setting that can clean just about anything in your home. How many times do you find yourself running the vacuum for more than a half hour anyways? 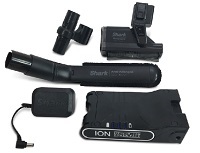 The Shark comes with a 2 different 25 volt battery packs that they call their ION Pack. It will take you approximately 3.5 hours to fully charge one and it will run for between 10 and 20 minutes depending on which mode you use and what type of floor you are cleaning. One huge advantage over the Dyson is these batteries are removable so you can charge one pack while you are using the machine. It essentially doubles your cleaning time and even gives you the option of purchasing extra batteries for an almost unlimited runtime. This flexibility gives the edge to Shark here. Filtration is a very important quality for a vacuum cleaner to have, even a lightweight stick like these 2. The Shark IONFlex comes with washable foam filters which will save you money over having to buy replacement ones. Plus it has what they call their Anti-Allergen Complete Seal™ which incorporates a tight seal with their HEPA filtration to trap more than 99% of those microscopic allergens like dust mites and pet dander. This is very important for today’s households, especially those with carpets. The filtration is really good throughout the Shark lineup. The Dyson V10 vacuums come outfitted with full machine HEPA filtration that is also rated to trap 99.97% of the smallest of allergens down to the size of 0.3 microns. Dyson always have lifetime washable filters included in their lineup and they are among the best in the business. Their filter design is such that it will last for the life of the vacuum as long as you follow their guidelines for cleaning it. Their dust bins also have a hygienic emptying design to make sure none of the dust particles will come into contact with your skin. This category is a very close one but the filtration edge goes to Dyson. Attachments are very important when it comes to cordless vacuums. You will spend a lot of the time cleaning hard to reach surfaces all over your house so you need the right tools for the job. The Shark IONFlex comes standard with a basic anti-allergen dusting brush, upholstery tool, and crevice tool. Shark provides a long list of extra accessories that you can purchase including different sized crevice tools, a pet multi tool, a motorized mini pet tool, a home and car detail kit, and their unique MultiFLEX™ under appliance wand. This is a great attachment for getting dust and small food particles out from under your appliances without the need to move them. Each of the Dyson V10 models come with their combination tool and crevice tool, but the Absolute and Animal configurations also come with a soft dusting brush and a mini motorized tool. Just like with the IONFlex, Dyson provide a long list of available tools that you can purchase to outfit the machine with what you need for your household. Some of these include a handheld tool kit with different sized brushes, a quick release mattress tool, a long extension hose, and an angle adapter for cleaning in many different angles. Both of these companies give you the basics when you buy their vacuum and provide a long list of extras that you can buy to suit your needs. This makes the attachments category a solid tie! Upright mode is only part of what most people will use their new lightweight cordless cleaner for. Both of these models can operate in handheld mode using any of their attachments for the ultimate in portable cleaning. Since they both have all the accessories you need and both are easy to remove the extension wand for handheld operating, it really comes down to power. The Dyson V10 simply has more power so it can pull up more dirt in this mode. For that reason, we give a very slight edge to the V10 in this category. Versatility is another trait that you are interested when talking about cordless vacuums. 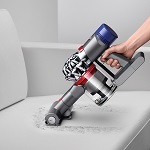 While both vacuums can operate in handheld mode, have a variety of attachments, and can clean multiple types of floors there is one characteristic that sets the Shark apart from the Dyson. The Shark comes with their MultiFLEX™ technology which is quite unlike anything you find on other brands and models. With MultiFLEX™ the wand has a joint that bends in the middle providing a couple of key advantages. The most obvious is it creates an angle that allows you to get the cleaning head or attachment under furniture or in tough to reach places. You typically won’t have to move tables or other large items to easily reach underneath. And the second benefit is it allows the IONFlex to fold over when stored so it will be much more compact than other upright vacuum cleaners. It’s this key feature that gives the Shark the victory in the versatility category! It’s obvious after going through the various categories that the Shark IONFlex 2X with DuoClean matches up very evenly with the Dyson V10. The choice comes down to your budget and what types of surfaces you are primarily cleaning. The Shark is just about the same price as the base model Dyson Motorhead but offers more for your money. The IONFlex is an excellent choice for mostly smooth floors and some low to medium pile carpets. It also is more flexible to reach under your furniture and other large items. If this is what you are using it for then the Shark IONFlex 2X is our top choice. Click here to go to our favorite online store for current prices and availability. However, if you have mainly carpets or a larger home and need extra power for deep cleaning then the Dyson V10 Animal or Absolute would be our recommended cordless vacuum. The filtration and power edge that it has makes it an ideal choice for these applications, with the additional cost being completely justified. Click here to visit our recommended ecommerce store for pricing and other options.